The use of the rosary or prayer beads helps to bring us into contemplative or meditative prayer—really thinking about and being mindful of praying, of being in the presence of God—by use of mind, body, and spirit. The touching of the fingers on each successive bead is an aid in keeping our mind from wandering, and the rhythm of the prayers leads us more readily into stillness. When I first I discovered Anglican/Episcopal Prayer beads (or the Anglican/Episcopal Rosary), they quickly became an invaluable tool in my prayer life. At a very basic level, for me the presence of the beads served as a reminder or call to prayer. They also provided structure during my personal prayer. And, perhaps most significantly, touching the beads during prayer helped me with focus and concentration, lulling, with each touch of a bead, my mind to be still and know God. I wanted to share this new “prayer tool” with friends and family. 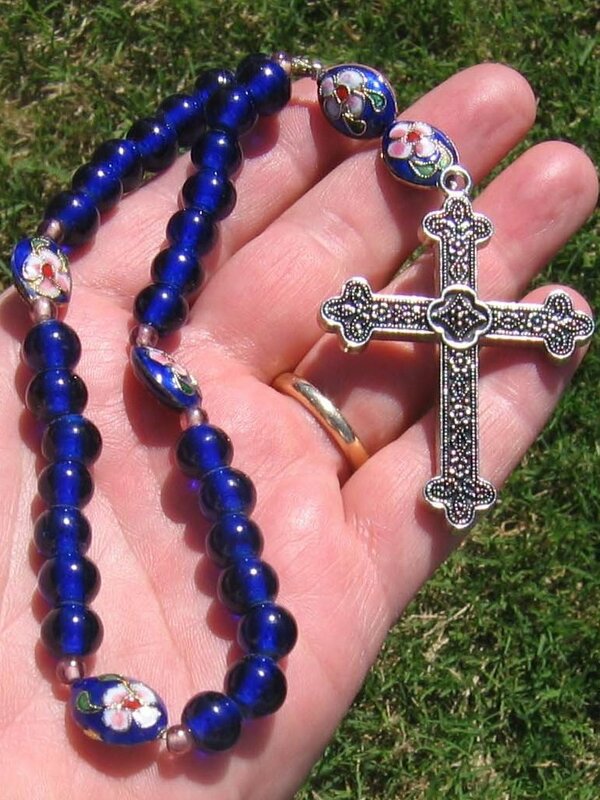 At first, I began purchasing rosaries to gift to those I knew who were going through difficult times hoping that, through prayer, they might connect with the powerful presence of a loving God and receive strength and comfort they needed. The response from the initial recipients was positive. In addition to using them in prayer or meditation, friends shared that they carried the beads with them during difficult encounters, doctor or hospital visits, important meetings and the like. They shared that, while they might not form any words, just holding the beads felt in itself like a prayer. Some shared that they would place them in a visible location in their home or work as a reminder that all would be well. While the responses and uses varied among the prayer bead users, the common theme shared by all was that the beads helped them. Because of the positive response, I wanted to see if I could make the rosaries myself, allowing me to more freely distribute them. I have found great joy in creating prayer beads. The act of stringing a set of beads not only provides me with a wonderful creative outlet, but it also is in itself a prayerful time for me. As I create each rosary, I hope and pray that the recipient may know that God is always near. While some of the rosaries I make contain, as the anchor piece, a cross or crucifix as a symbol of God’s presence, I also enjoy using different charms or pendants such as a gemstone, a heart, religious medallion, or some other symbol of God’s love for us. Assisted by some members of my faith community, Church of the Holy Apostles Episcopal Church in Wauconda, a small prayer bead ministry developed as a means to provide and distribute rosaries, information and prayers to those interested in this form of prayer practice. The prayer bead ministry also provides information regarding the beads as well as suggested prayers or meditations and websites where more information regarding this prayer practice can be found. 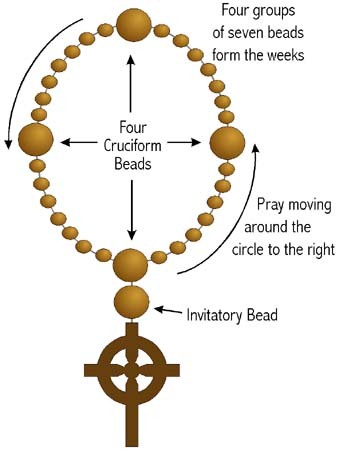 While the information provides a place to start, praying with beads is a personal practice and people should feel free to develop their own prayers that reflect their personal situation and spiritual journey. Hopefully, as one’s individual prayer practice grows, he or she will quickly realize that it is not the words in the mind that matter but the thoughts from the heart that connect us to the Divine.